Built from the remains of an old famine workhouse, Sallyport House stands on the shores of the Kenmare River at the southeastern border of the Ring of Kerry. The house overlooks a picturesque harbour with views towards the mountains of the Beara Peninsula. The pretty market town of Kenmare, with its friendly music-filled pubs and excellent restau- rants, is just five minutes away, while Killarney and Glengarriff are both within easy reach. Sallyport adjoins the delightful Reenagross Woodland Park and is a wonderful base for exploring this beautiful region, which includes mountainous peninsulas jutting out into the sea, numerous gardens and the 10,000 hectare Killarney National Park. Sallyport House is a delightful Edwardian house in a really spectacular location, right on the edge of the harbour, surrounded by parkland and trees, and by Reenagross Woodland Park, yet still just minutes away from the centre of busy Kenmare town, the most south-easterly point on the renowned Ring of Kerry. Sallyport House was built from the stones of the demolished Famine Work house, and guests still cross the worn stone threshold from its principal door, a poignant reminder of a less prosperous past in the midst of today’s plenty. The owners, John and Helen Arthur, rebuilt the house in the 1990s. They are a fount of information on the locality and make their visitors very welcome. Inside, the main rooms are extremely comfortable, beautifully decorated and filled with antique furniture and Irish paintings. The bedrooms are particularly charming, with large bathrooms and breathtaking views over the gardens and the Kenmare River. 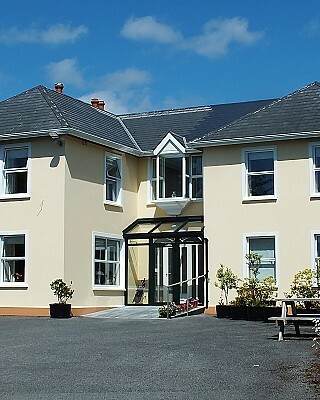 This is a town house and does not serve dinner, but there is a wide choice of restaurants locally, both in Kenmare town and in the surrounding area. Sallyport is the perfect base for exploring the Ring of Kerry and the lesser-known (though perhaps even more spectacular) Beara Peninsula on the borders of County Cork. There are world-famous gardens at Dereen and on Garnish Island, salmon fishing at the famous Butler Pool, in Waterville, and sea trout fishing on Lough Currane, while deep sea fishing can also be arranged in the locality. Waterville and Parknasilla are but two of the many famous golf courses within easy reach, horse riding can be arranged, and there are a wide variety of coastal and mountain walks to suit all tastes and abilities.